Mattest offers its customers a professional, efficient and reliable construction materials testing service, which includes the prompt and accurate reporting of test results. Our experienced engineers and technicians can execute a range of services, to all relevant British, Irish and European Standards, with specific tests designed to suit particular materials and site environments. Mattest has modern, fully equipped, accredited laboratories in Belfast (UKAS Accreditation Number 0203), Dublin (INAB Accreditation Number 286T) and Cork (INAB Accreditation Number 289T) and can provide fully accredited on-site materials testing facilities for major projects throughout Ireland. 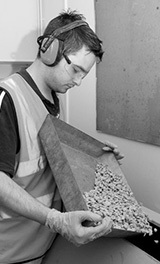 Most tests to British, Irish and European standards can be carried out on construction materials. We can provide services for concrete, aggregates, bituminous mixes, soils and non-destructive tests to name but a few. Mattest are pleased to announce that they are one of 60 companies across the island of Ireland to participate in the All-Ireland Pollinator Plan 2015-2020. The Mattest Dublin laboratory has been contracted by the construction contractor BAM Building to provide the materials testing contract for the new Boland’s Quay commercial hub in Dublin. Mattest Belfast have been awarded the materials testing contract with Woodvale Construction, on the development of the new school. The project is planned to be completed by June 2021.